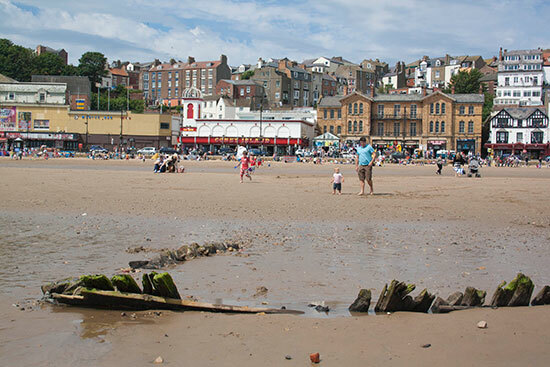 In Scarborough's South Bay a wreck of an old wooden boat is exposed when the sand is washed away by strong tides. George Westwood presents some compelling ideas as to its origin: Having done a great deal of research and spoken to elderly fishermen I am of the opinion this wreck is in fact the local Yawl Vivid official number 29693 built Yarmouth 1861 owned by Henry Wyrill of 20 Sandside Scarborough first registered in Scarborough 6/3/1869. The local lute sterned Yawls worked herring nets and basket lines and carried a small boat to haul the lines called a calf but pronounced corf, and was worked by 6 men and 3 boys usually from the workhouse. The Vivid was a ship of 36 registered tonnes and her full details are available at the public records office in Northallerton. She was lost whilst entering Scarborough Harbour in a northerly gale 8/11/1888 under command of the skipper Ballasette. Vivid had a keel length of 50ft and an overall length ( from sternpost to stem) 56.60 ft which in laymen's terms would make her a little bit over 60ft. Vivid was built as a lugger (Yawl) and converted to Dandy rig in the mid 1870's Yawls were usually laid up for the winter but she was actually working as a collier during the winter months carrying coal from Hartlepool to Scarborough when wrecked on 18th March 1888. Obviously any coal left in the wreck would have been salvaged or scavenged had this been ballast some might well be remaining but no so. Vivid was built by Daniel King at Yarmouth in 1861 for Henry Wyrill of Scarborough and was first registered at the port 3/6/1861 by her official number of 29693 and later registered by her fishing number SH13. Over the passing years Wyvill took in many partners too numerous to mention in this missive but on 23/8/1885 he was declared bankrupt and became a part owner of the ship along with James Ellis and others. Vivid was then sold on 18/3/1886 to local banker (possibly repossessed) before being sold to Christopher Nicholson of Scarborough on 20/7/1886. Vivid is known to have been clench built but the wreck on the beach is without doubt carvel, but she may well have been doubled and clenched ? Conclusion: It can only be assumed that this is in fact the Vivid until such a time as someone takes the time to examine and measure the wreck accurately and record the dimensions and compare them to known fact. Pictures above : Some photos from 2012 showing the wreck of the Vivid. Picture above : This photo was taken by maritime historian George Westwood in 1975. "Arun" of Littlehampton as she is described in the newspaper reports of that juncture which in itself is misleading because she was owned and registered in the port of Arundel, Littlehampton probably the port she was going to or coming from when caught in the Easterly storm of October 1880 running ashore on the south beach Scarborough. Arun official number 2667 was built in Sunderland in 1842 and owned by J P Henly of Tarrant St. Arundel a square rigged ship( brig) of 145 tons 70.7ft overall length 20.6 beam and 12.6 depth. Zwei Gebruder was driven ashore along with numerous other sailing vessels of various rig and the one that needs most discussion, the German ship Zwei Gebruder is often listed as the Dutch ship Hebruder,but the newspaper of the day got it wrong. The German word for 2 is zwei whilst the Dutch word for 2 is twee. In both Dutch and German gebruder is the plural of brother ie brothers and her name is easily translated as Two Brothers (German). Also she was registered in the German port of Carolineseille (East Friesland) and was carrying coals. Furthermore she was salvage and sailed from Scarborough for many years later and renamed Five Brothers and reallocated official number 82951 and owned by Isaac Cox of 4 East Sandgate Terrace and used as a collier. Mary of South Shields Brig O.N.2190 of 159 tons in ballast wrecked south of the Spa. Owner David Miller of Bedford St South Shields. Jeune Adolphe a French Brig of Dunkirk in ballast broke up very quicly. Ellen of Faversham Spritsail O.N.60248 of 40 tons some doubt that she may have been refloated later as she appears in later records? Owned by Mrs Ellen Wood Sittingborn Kent. OX Aland carrying deals position not known possibly a Norwegian timber ship. Picture above : Ernest Roe's depiction of the October 1880 storm. (Picture courtesy of Scarborough Library). 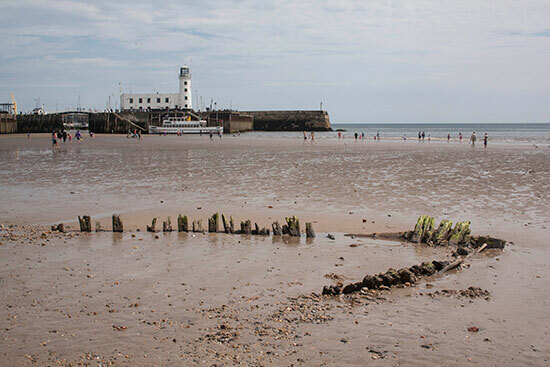 Wrecks were common in the South bay as North east gales pushed the ships away from the harbour mouth and onto the rocks by the Spa. 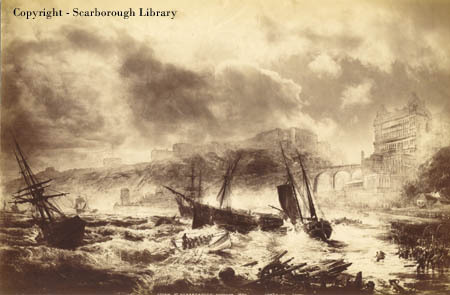 One report in the Scarborough Evening News stated the wreck of the Vivid to be that of the Coupland which sank in 1861. This was a famous incident which led to the loss of the lfeboat the Amelia in 1861. This is clearly erroneous as the Coupland sank whilst on the Spa rocks. The wreck of the Vivid is clearly nowhere near the Spa and the Coupland would have shared the fate of most wrecks near the Spa and would have been smashed to pieces. 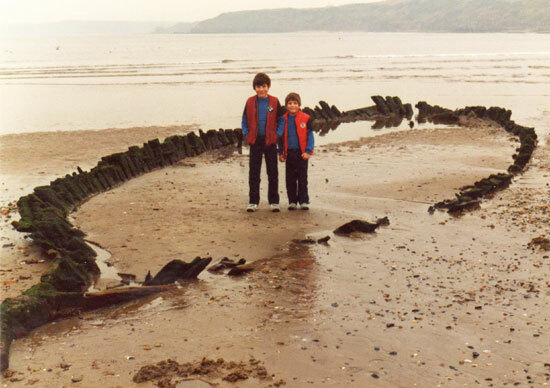 Another theory was the wreck of the Vivid is the Arun which sank during the storms of 28-30th October in 1880. On that night many ships went down and when the storm was over the South Bay was littered with wrecks. So fierce was the storm that when the Arun sank the lifeboat was already involved in the rescue of the "Jeune Adolphi". At this moment "Almost suddenly and at the imminent risk of their lives, three or four gallant fellows pushed off in a smacks boat, and reaching the Brig, succeeded in receiving into their little shell the six men forming the vessels crew. This deed of daring was greeted with long and ringing cheers". The Arun does appear to be roughly in the position of the Vivid but the rweck is much smaller than the Arun. The Arun, Official number 2667 built Sunderland 1842, was a ship of 145 tons and 130ft in length owned by J P Henly of Tarrant St. Arundel and was in ballast when lost, in a position described as being between the Frenchman (Jeune Adolphe) and the West Pier and the photographs of that time confirm this to be true.